As alot of you have seen on facebook I have bought a new daily. It's a 1991 Malibu Gold NA6. 1 of only 5 Fitted with air con, 5 speed manual, brown davis roll bar, Konis, king springs, whiteline front sway bay. momo steering wheel. Has amplifier, splitter in boot with great sounding stereo professionally fitted. Polished petrol cap, Exhaust and extractors fitted, sounds great. 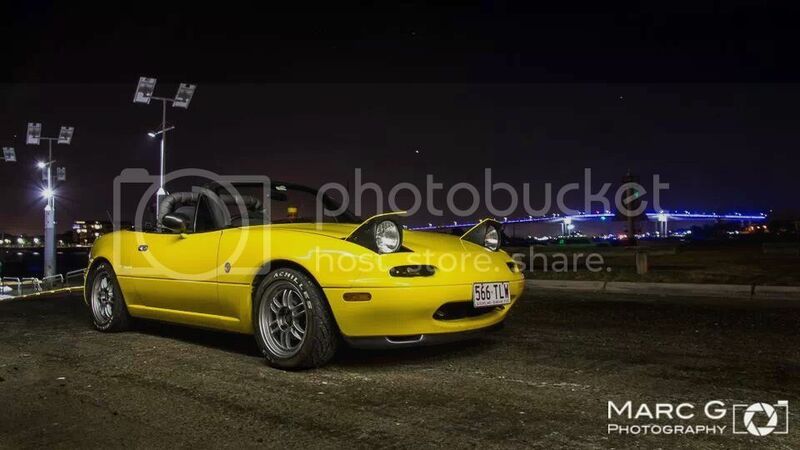 Adrenaline 123 semi slicks on15 inch by 7 inch Enkei RFP01's with pro nuts. Skunk 2 knob, bee sting aerial. Boot covers, handbrake cover with matching yellow stitching purchased from Uk. Altezza rear tail lights, turn signal indicators replaced with more stylish indicators and a front lip . Took some photos last night with Ben and Marc, here's a few. 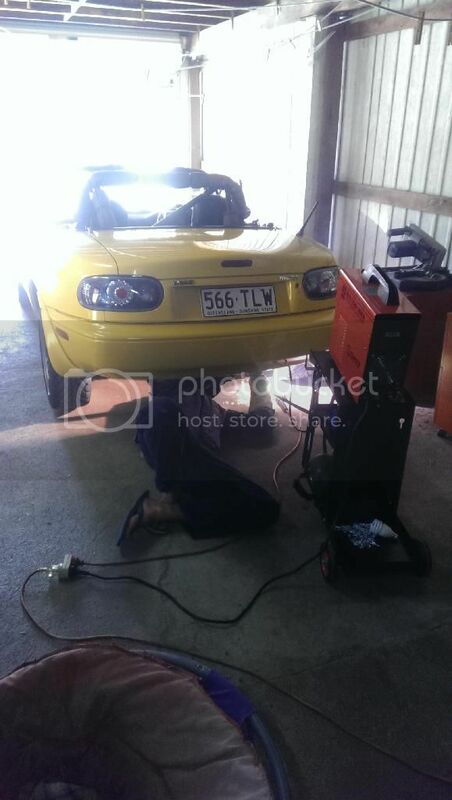 Also welding up the exhaust yesterday. What fun. Haha everyone but me hates them. Swap your setup for turbo?and yes. That's probably what may happen. I'll wait to have a ride in yours when it's tuned and see what I think. After the first tank fuel economy is looking ok. Did 468kms off 40litres (8.5L/100) with a mountain run and lots of flat to the floor enjoyment... Had an awesome time in the clem7 tonight too. Should have recorded it. Ran from 20km/hr to 80 a few times in second. Need itbs to make it roar. Last edited by Clean_Cookie; 24-12-2013 at 10:50 PM. Don't listen to them. You're amongst friends here. Love your car. It has so many details similar to mine. 2 weeks driving that and you'll realize how much money you are wasting on the Astina. Haha yeah. I am Still chipping away at the astina. Hopefully I'll get the car wired and powered up for a test tomorrow. Most of the bits could swap over anyway. (there was a reason I bought what I have ��) the astina will be the daily. Big stereo and lots of room for carrying stuff. Big loud body kit and decent power. This car will get an lsd and a new gear knob and wheel and that's about it. Insured for 9k currently. Also I managed to get 8.5L/100kms including a mountain run and general foot to the floor enjoyment around town.Halfway through the next tank and at 270km on halfway. Better than the astina that's for sure. Last edited by Clean_Cookie; 26-12-2013 at 10:57 PM. Have to agree with Dan, altezza tailights look very average. Pit crew conversion stat! Could buy a stock JDM AE86 or have a very nicely modded mx-5 for less money. 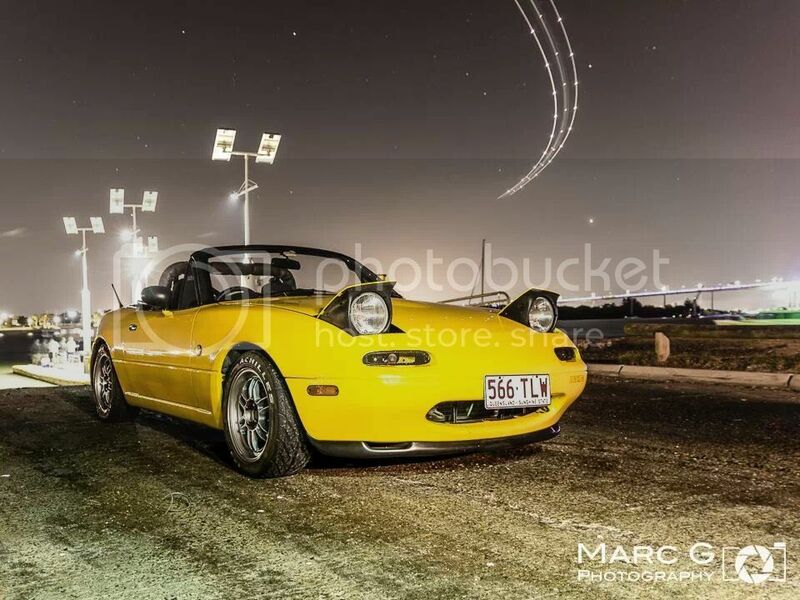 mx-5 is looking better and better everyday. Just looking at this makes me want to drive one with the top down and enjoying the sun. Thanks guys. Well the fun was shortlived. Main crank pulley started wobbling, common failure with these motors. Took two hours to get a new bolt and key from Ford/Mazda but it only took a few hours to remove and fix. Fired it up this arvo and timing was wrong. Pulled it apart again and got it right. Dispite it failing and the rain it was a breeze to do. Must be one of the features imported from the FE motor. My old housemate had a red/black one stripped full cage, silvertop 2 way lsd. Different league to the mx5. Talented driver helps but it's smelly, incredibly noisy (huge diff ratio -4400rpm at 100) and rose joints everywhere makes for a hot crashy ride. Through the mountains however I doubt I'd get close to him. This car is easy to drive, has ac (get one with p/s if you want more comfort.) Top down is fun in the evening or late arvo. I was under the impression that Malibu's have the large nose crank that aren't prone to failure. Well done on spotting that! A new bolt and key is much easier than the alternative. long nose cranks didn't appear until 92. Driven 3k already. Just love it. Its so economical and top Down after sunset is beautiful. Going to the drive in movies when they play something we want to see. Crank is all good still which is good. Did Mt Lindsay and nebo today. Much prefer the former. It's got more room to recover, and you have no risk of losing any points. Seats, arc intake and a set of cams on the way at various speeds. (massive thanks to haighie for picking up the seats!) -im a man of doubles so I'm sure you can guess what they are. If they look rubbish on yellow they'll be up for grabs. Having a set of Yokohama AD08R tyres fitted and the wheel alignment checked. Ellen has grown to like it (although the gear knob is horrible apparently, and the steering wheel is too chunky.) Easy to please that girl! Last edited by Clean_Cookie; 06-01-2014 at 12:12 AM.